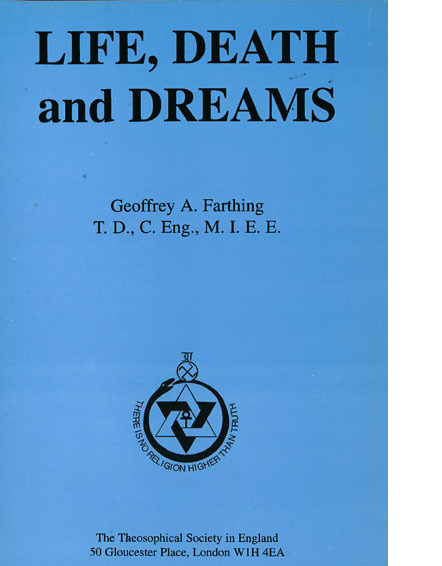 Life, Death & Dreams, Geoffrey FarthingTheosophy takes us beyond the familiar, expanding and deepening our view of life, which we come to see as a vast panorama of evolution and unfoldment. The author takes us on a journey which explains theosophical ideas including Jiva, Prana, Dreams and Egoic Consciousness. Theosophy takes us beyond the familiar, expanding and deepening our view of life, which we come to see as a vast panorama of evolution and unfoldment. The author takes us on a journey which explains theosophical ideas including Jiva, Prana, Dreams and Egoic Consciousness.